It wasn’t until a few weeks ago that I realized I’ve been using OmniFocus all wrong ever since the Forecast View came to the Mac. The Forecast View is awesome. But it’s not where your daily to-do list should live. I don’t know about you, but if I look at my to-do list, it is mostly things which I want to do today. Only one or two (at best) are things which actually have a hard and fast due date of today and need to be done. By living in the Forecast View, I’ve slowly developed the habit of setting the items which I want to get done as being due today. Or, if I know I can’t get to it today then I’ll set it to be due tomorrow or the next day. Seems natural and logical when your in the middle of it, but it’s actually not the best way to go about things. I was a heavy user of due dates, but the reality was these dates were fictitious. It was more a case of when I’d like this task to be done or worked on. This could be a problem as some tasks truly were due on a specific day, but they would be mixed in with other tasks in the Forecast view that were more wishful thinking than anything else. I was able to get by with this usage for a couple of years. My habit was to simply push out the due dates when things got crazy and desired tasks did not get done when I had hoped. Same here. Fortunately, Chris pointed me to Sven Fechner’s excellent OmniFocus Perspectives Redux series, which is helping set me straight with a much more logical — and honestly, a much less stressful — way of managing my daily task list. See also Tim Stringer’s article on why it’s important to use due dates sparingly. Another cool thing about using this Today perspective is that you can pull it out into its own window and “Minimalize” it by hiding the left and right sidebars and hiding the toolbar. And you end up with nothing but a list of your task list for the day. I use an OmniFocus-only Keyboard Maestro macro to opens the Today perspective in its own window, automatically hides the sidebar, toolbar, and inspector, and then resizes the window to be 475px wide and 600px tall. 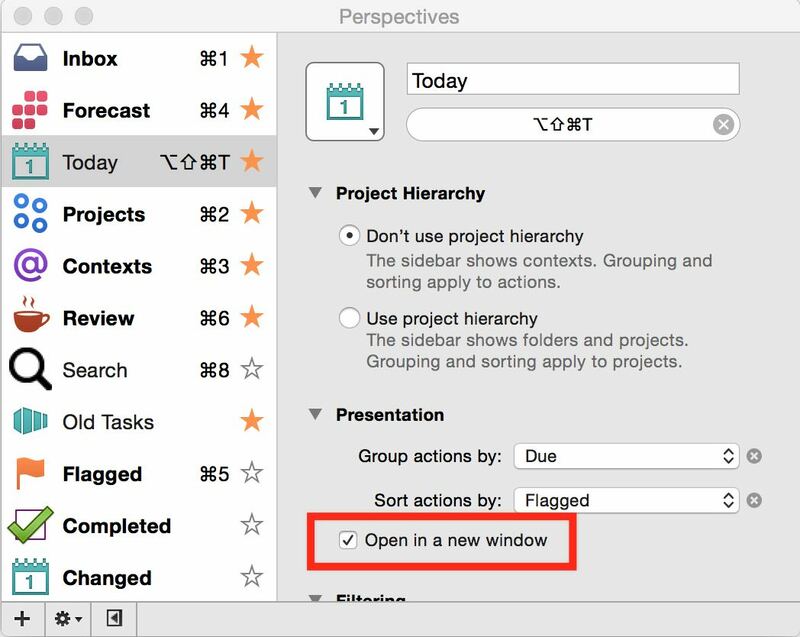 Two notes about using the Today perspective like this: (1) You need the Pro version of OmniFocus 2 in order to create custom perspectives; and (2) in the setup window for that perspective you’ll want to have it open in a new window, so that the changes to window size and hiding the sidebar, et al. 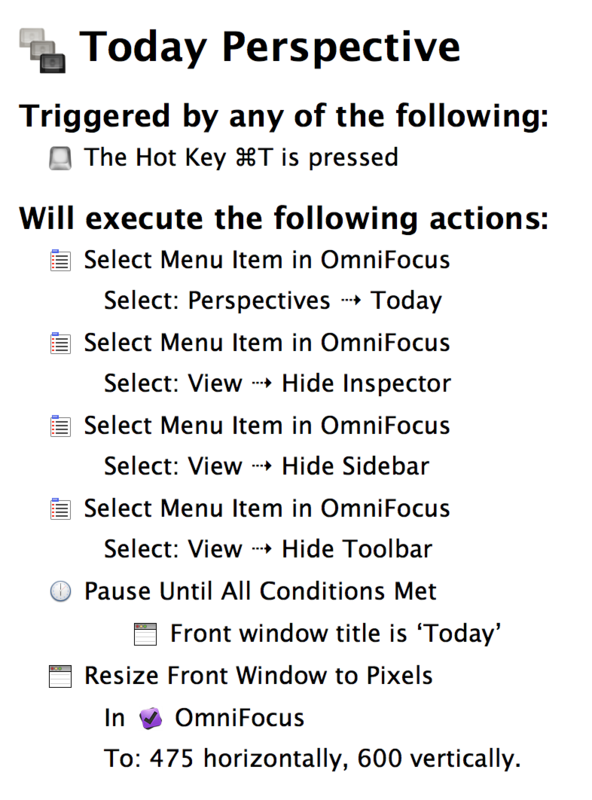 don’t mess up your Main OmniFocus window. See here for how the macro works. Download it here. It’s the stuff like this that I love about OmniFocus. It really is the best GTD app out there. I’ve been using it every day of my life since early 2010 and I’m still learning and improving on it. Not to mention the brilliant and clever community of folks who use OmniFocus and share their knowledge with the rest of the world. Up next for me is to get a better handle on using Contexts and Project Folder hierarchy so that when I am doing “work” work, I only see those tasks, and when I am doing “peronal” work I only see those tasks. But, one step at a time, Shawn.